A last-minute win on Feb. 6 in Gainesville, FL helped propel the No. 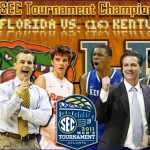 13 Florida Gators over the No. 22 Kentucky Wildcats in the Southeastern Conference standings. Saturday in Lexington, KY, the Wildcats (20-8, 8-6 SEC) got a measure of revenge by defeating the Gators (22-6, 11-3 SEC) 76-68 in Rupp Arena, extending their home winning streak to 33 games and earning head coach John Calipari his 500th victory. Guard Darius Miller posted a career-high 24 points for Kentucky on 9-of-15 shooting, and the Wildcats piled it on late in the second half to pull away with a decisive victory. A 7-0 run toward the end of the first half capped by a three-pointer by G Brandon Knight put UK up four with 5:01 to play. 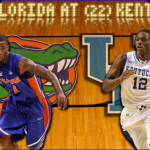 UF responded quickly as G Kenny Boynton scored five-straight as part of a 7-2 run to give the Gators a 27-26 lead. The teams went back-and-forth with the Wildcats pulling ahead 34-33 on a free throw by Knight. Kentucky scored five-straight to start the second half, but an 8-2 run by Florida including two treys from Boynton tied the game at 41. That is when things fell apart for the Gators. The Wildcats took off on a 10-2 run to go up 58-49 with 9:39 to go. Florida cut their deficit to five on a layup from senior forward Chandler Parsons, but a three from Miller and a 8-2 run gave Kentucky an 11-point lead with 4:13 remaining. UK went up a game-high 12 points with the clock winding down. Back-to-back field goals from redshirt senior center Vernon Macklin and senior F Alex Tyus reduced the Wildcats’ lead to six with 42 seconds left, but the Gators were unable to capitalize. Complementing Miller’s 24 points was Knight, who scored 16 while adding six assists. 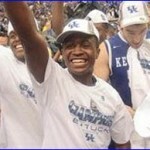 G Doron Lamb added 14 more for Kentucky. Fs Josh Harrellson (12) and Terrence Jones (nine) were strong on the glass, combining to grab 21 of the team’s 32 rebounds. Boynton led the way for the UF with one of his best all-around performances this season. He scored a team-high 21 points on 7-of-13 shooting while nailing 5-of-9 three pointers and dishing four assists. Parsons was an efficient 6-for-11 from the field for 15 points to go along with eight boards and seven dimes. Macklin contributed 10 points and five rebounds, and Tyus scored nine with three offensive rebounds. Junior point guard Erving Walker struggled all game, finishing 2-of-11 from the field (1-for-6 from downtown). He hit all five of his attempts from the charity stripe but was blocked numerous times, took a few questionable shots and turned the ball over twice. It was a block party for the Wildcats, who rejected the Gators seven times; former Florida F Eloy Vargas blocked Walker twice in five minutes. Kentucky won the rebounding battle 32-29, coughed up four fewer turnovers (6-10) and was more disciplined defensively by committing seven fewer fouls (14-21). Luckily for UF, SEC West leader Alabama (19-9, 11-3 SEC) simultaneously fell 68-63 to Ole Miss (18-11, 6-8 SEC) on Saturday; the teams remain tied for the conference lead and will square off in Gainesville on Tuesday at 7 p.m. The game will air live on ESPNU and marks Senior Day for the Gators. I think most of us saw this coming. I am not shocked in the least with the performance today. I was hoping for more but expecting what we got, maybe even less. I hink we will have a strong showing against Bama but may do the same thing again in Nashville as we did today. Coulda sworn today was Saturday. Rupp is a very tough place to play. Hang in there Gator Boys. Tyus was pretty much absent the whole game but Walker killed us. I still don’t believe his gets the team involved like a true point guard should. Focus on him for a game and you’ll see more negatives than positives. I’m really curious if Billy’s admiration for walker will wane once we get Beal and Rosalio on the court along with Wilbekin next season. We should beat Bama but Vandy in Nashville is going to be tough. That gym is one of the worst designed buildings I’ve ever been in. What coach wants to coach from under the baskets and what sports reporter wants to spend the whole game look at high top sneekers?